by the North Carolina Arts Council. Originally published in African American Music Trails of Eastern North Carolina, copyright 2013. In eastern North Carolina, public school band directors have often played a crucial role in inspiring and instructing rising generations of musicians. One of the most influential band directors of earlier generations was Geneva Perry, who taught music at Adkin High School in Kinston. A Washington, D.C., native, Perry had played saxophone in the International Sweethearts of Rhythm before she came to North Carolina. The Sweethearts—all women musicians—were a multiracial, majority African American big band. The band’s origins were at the Piney Woods Country Life School in Mississippi, which sponsored a touring student band in the 1920s and 30s. During the 1940s, while on tour, several band members struck out on their own, and set up housekeeping together in Arlington, Virginia, outside Washington. The Sweethearts were wildly popular throughout the World War II years, touring with the United Service Organization, challenging all-male orchestras in battles of the bands, and starring in a movie titled International Sweethearts of Rhythm. Well, see, she was our band director—Nathaniel Jones’s, Thornton Canady’s, and my band director. She’s the one that’s responsible for me knowing what I know. Oh, she played a sweet alto sax. I was in the [Adkin] High School band. Ms. G. F. Perry was my conductor in the 50s. And she was really wonderful, so I just wanted to be like Ms. Perry. She encouraged me to practice, and she told my Mama that they had a workshop at Virginia State for band students in high school during the summer. So each summer I would go to a music camp in Virginia, and when I finished high school, I went to Virginia State to major in music. She was a great, dedicated musician, and she loved her profession to the point that she wanted to put what she had inside of her into her students. So she started a little jazz band for the students, and we played. And she would even come to your home and listen to music, talk to you. Teachers don’t usually do that. She introduced me to classical music, and that’s my favorite, for listening. She was a wonderful person. And she could play that saxophone, ooh, like heaven. Bryan, Sarah, Beverly Bush Patterson, Michelle Lanier, and Titus Brooks Heagins. African American Music Trails of Eastern North Carolina, p. 17. China, 2013. Deans, Karen. 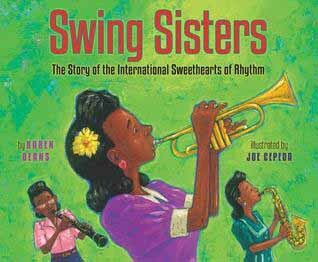 Swing Sisters: The Story of the International Sweethearts of Rhythm, front cover. New York: Holiday House, 2015. Accessed November 9, 2016 from Goodreads. https://www.goodreads.com/book/show/18378913-swing-sisters?from_search=true.